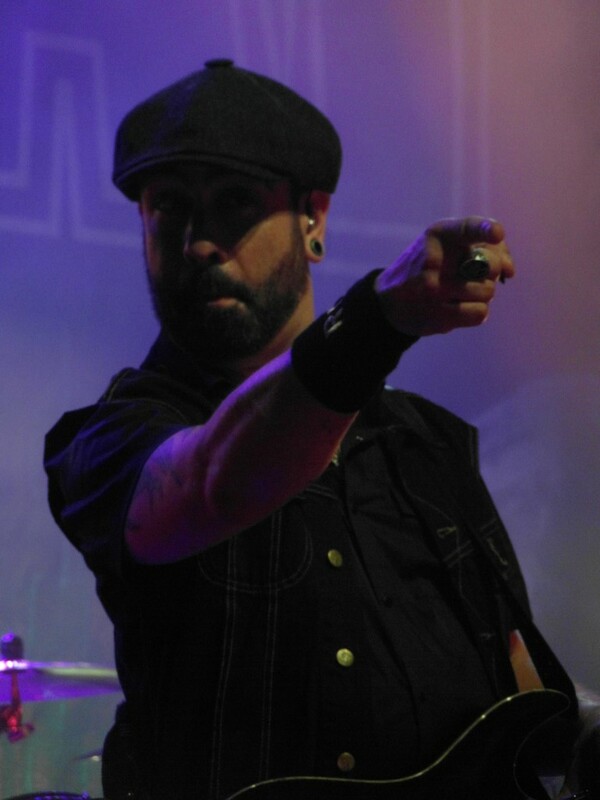 Share the post "Gig review: VOLBEAT – ABC, Glasgow, 6 June 2018"
There can’t be many bands who have their own personal busker, but walking down Sauchiehall Street towards tonight’s venue I could hear the strains of an acoustic guitar and someone blasting out a decent version of ‘Lola Montez’. Apparently the enterprising gentleman had been there most of the day running through the Volbeat back catalogue, obviously a man who knows his audience! Tonight’s show was part of a string of warm up dates by the band in preparation for a run of festival dates including a main stage appearance at the Download festival. ‘Warm up’ was an understatement as the lovely summer weather outside led to the ABC feeling like a sauna inside. No matter, we were here to rock with Denmark’s finest and with a capacity crowd in the hall the atmosphere, like the temperature, was at boiling point. First up we had a support slot from Irish rockers Fangclub. 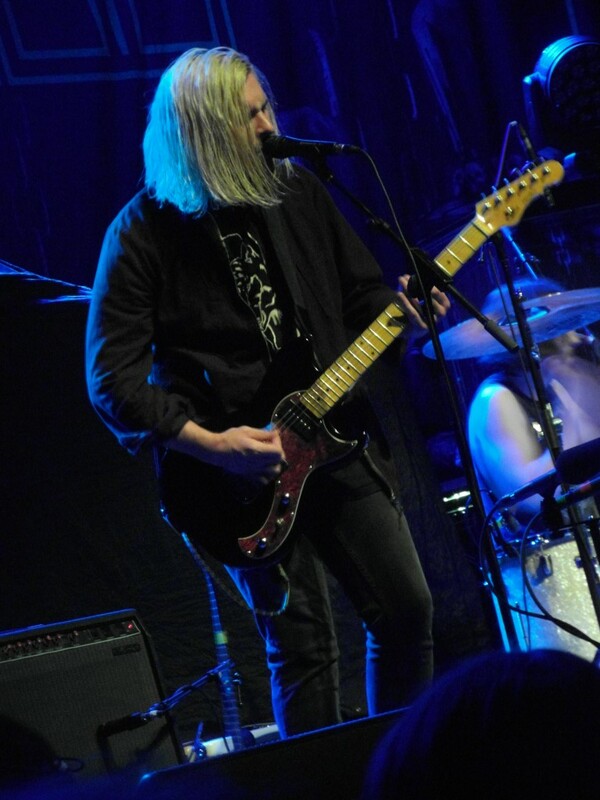 The three piece clearly worship at the church of Nirvana, not only sounding like them but looking like them as well, especially guitarist and vocalist Steven King who is a dead ringer for Kurt Cobain. The guys played tracks from their self- titled debut album which has done well in their home country. Their alt-Grunge sound may have been a bit at odds with Volbeat’s music but they guys did a decent job and got a good reception. They also threw in a couple of covers, the first being a grunge version of Elvis’s ‘Suspicious Minds’ and the other being Nirvana’s ‘Heart Shaped Box’ just to emphasise their influences. With the hall now full and doing a good impression of a pressure cooker the PA blasted out Motorhead’s ‘Born To Raise Hell’ heralding the entrance of Volbeat . 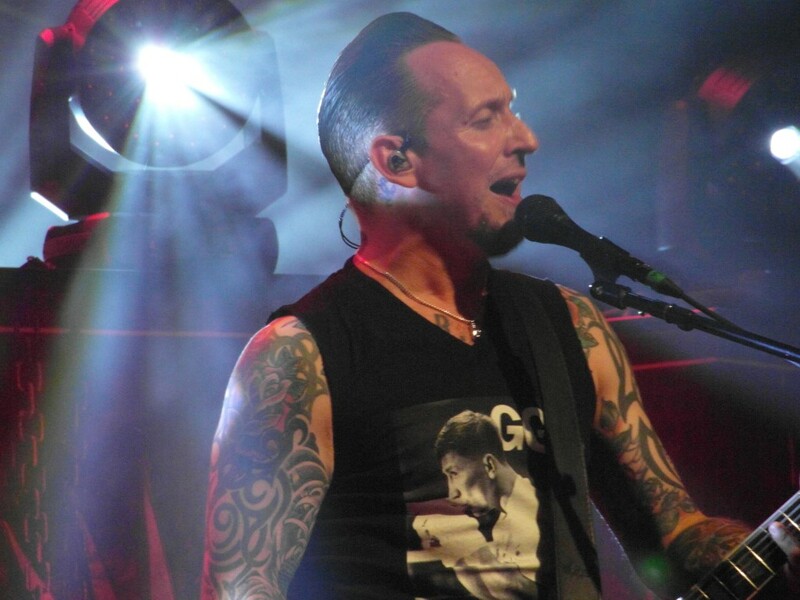 Michael Poulson took centre stage as the band kicked off with ‘The Devil’s Bleeding Crown’ with the stage bathed in red light. The guys then continued with three shortened songs played in rapid fashion, namely ‘Heaven Nor Hell’, ‘A Warriors Call’ and ‘I Only Want To Be With You’. The buskers favourite ‘Lola Montez’ followed with lead guitarist Rob Caggiano taking centre stage for a blistering solo. 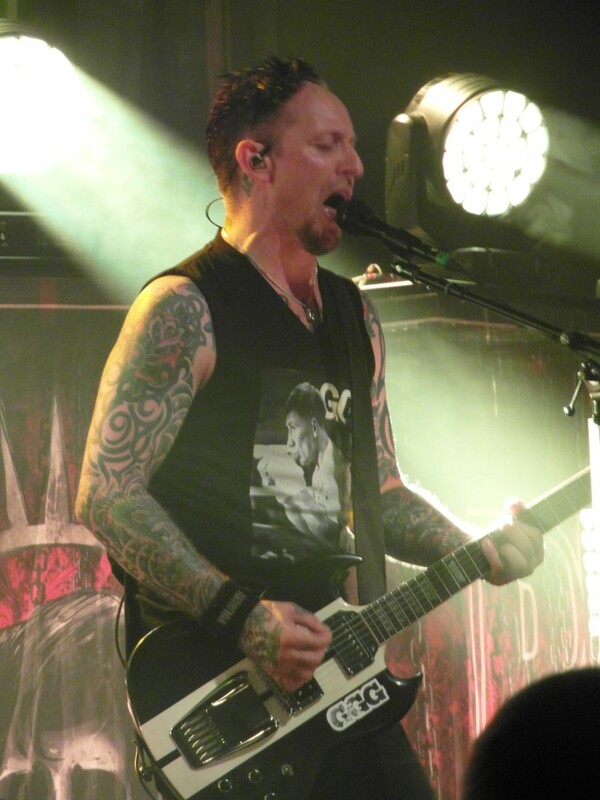 For me Rob coming into the band has been a huge boost, his technical guitar skills have moved the band up a notch as has his song writing, he and Michael Poulson obviously work well together. ’16 Dollars’ was accompanied by a barrage of crowd surfers which continued for the rest of the night and kept the security guys very busy. An acoustic guitar then appeared centre stage and Poulson played the intro to ‘Sad Man’s Tongue’ which as always was dedicated to Elvis and Johnny Cash. Michael was clearly enjoying the show with a huge smile on his face throughout. At one point he was handed a whisky by his guitar tech which he promptly gave to the fans in the front row in appreciation of their sweaty efforts. The band’s latest album ‘Seal The Deal and Lets Boogie’ featured throughout the set with ‘Seal The Deal’ and ‘ Let It Burn’ both being well received. Michael also announced that the band were ready to head back into the studio in November to record the follow up and the band played a new track ‘The Everlasting’ which sounded excellent. The guys then slipped in a bit of Danish on the chorus of ‘For Evigt’ which had the Glasgow crowd singing along as if they were as Danish as the Little Mermaid. ‘Doc Holliday’ rounded off the main set before the band and crowd took a well earned breather. The guys then returned for three encores including ‘Black Rose’ and the crowd favourite ‘Still Counting’ which brought the show to an end in fine style. 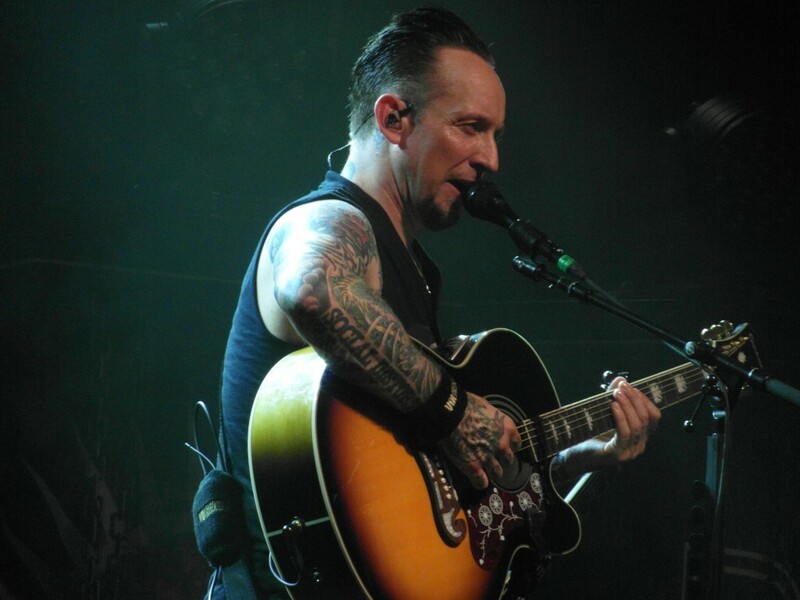 Michael Poulson vowed that following the release of the new album the band would be back touring in 2019. On tonight’s showing I think they may need to hire a bigger venue next time around, preferably one with air conditioning! 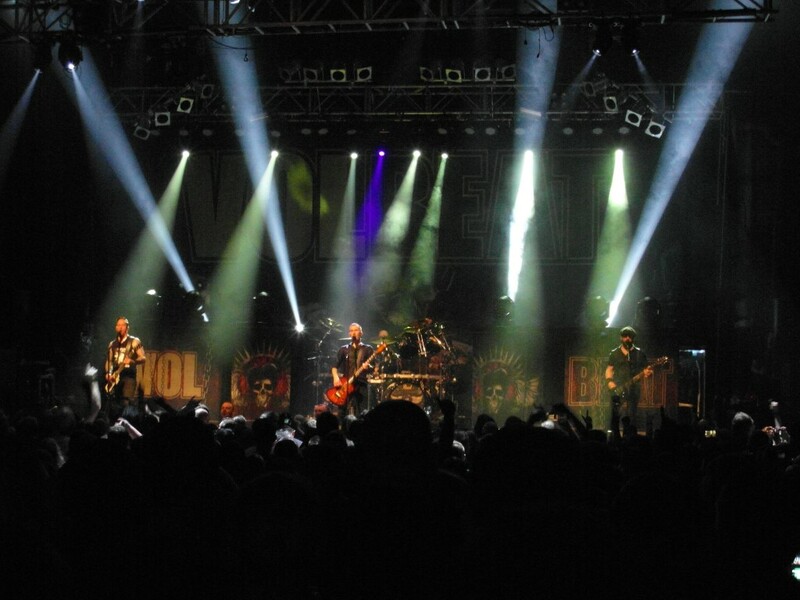 This entry was posted in All Posts, GIG REVIEWS and tagged 6 June 2018, ABC Glasgow, Elvis, Fangclub, gig, Johnny Cash, live, Lola Montez, metal, Michael Poulson, review, Rob Caggiano, rock, Seal The Deal And Lets Boogie, VOLBEAT. Bookmark the permalink.